The Pacific Northwest Cooperative Ecosystem Studies Unit (PNW CESU) is a partnership for research, technical assistance, and education to enhance understanding and management of natural and cultural resources. As a cooperative venture between 12 federal agencies dedicated to natural and cultural resource management and 18 leading academic institutions, three non-governmental organizations, and one state agency, more than $117 million has funded 909 projects (many with student involvement) under the PNW CESU master cooperative agreement. 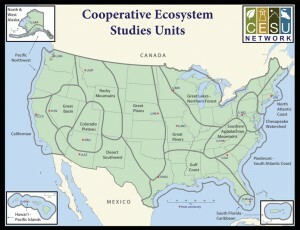 The PNW CESU is a member of the National CESU Network which consists of 17 regional Cooperative Ecosystem Studies Units, each representing a distinct biogeographic region of the United States, with all regions connected through the national network. The overarching goal of the CESU Network is to improve the scientific base for managing federal lands by providing resource managers with high-quality scientific research, technical assistance, and education.